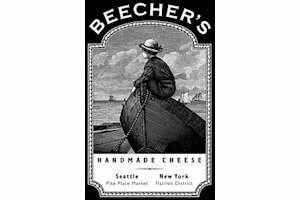 Kurt Beecher Dammeier, a cheese lover since childhood, opened his first Beecher’s Cheese shop in the heart of Seattle's Pike Place Market in 2003 and a number of years later, in 2011 a new store, cafe and restaurant was opened in New York City's Flatiron District. Both stores reflect Kurt's passion for making artisan cheese and his believe of eating food free of harmful additives and preservatives, as well as believing that people should know more about the food they eat – where it comes from, what goes into it and how it is made. The Beecher's stores have a unique open concept; glass-walled cheese-making kitchens - visitors can witness firsthand the centuries-old craftsmanship that goes into every batch of their award-winning cheese. Seven days a week, fresh milk is pumped into the holding tanks at Beecher's cheese-making kitchens and the day-long process of cheesemaking begins. The end result, under the skilled direction of the cheesemaker, is a wholesome, natural, pure cheese - full of flavor and high in nutrition.